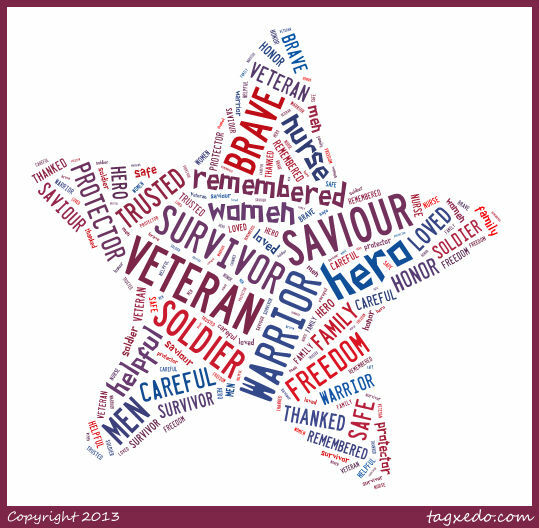 Students generated words to describe a veteran. In honor of Veteran’s Day, I always try to read the book America’s White Table, by Margot Theis Raven. If you’ve never read it, go get it out of your local library and read it in the privacy of your own home. That way, if you get teary eyed, no one will see. I always have to read it before kids get there so I can prepare myself. It is an outstanding picture book. The story tells the significance of the white table and each item laid upon it in honor of Veteran’s Day. At the end of the story, the narrator traces the word hero in the salt on the plate as her tribute to the veterans. After subtly wiping my watery eyes, I lead a discussion with my students about synonyms for hero. Inevitably, the discussion morphs into adjectives for veterans, but honestly, I’m okay with that. In this particular lesson, I’m more focused on teaching my students to respect and recognize veterans. I can teach about the true definition of synonym some other day. 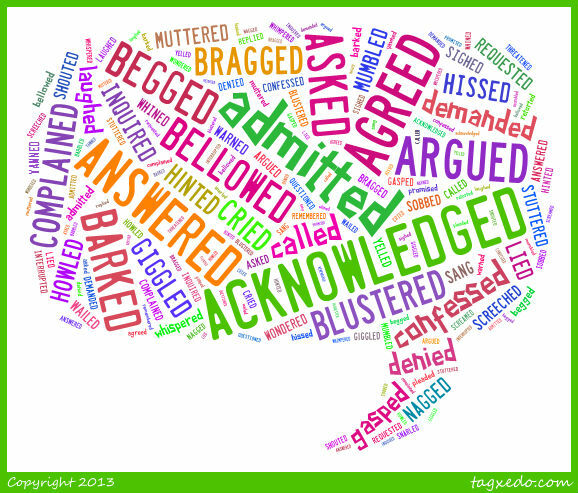 This year, we created a word cloud on Tagxedo with all of our descriptive words. 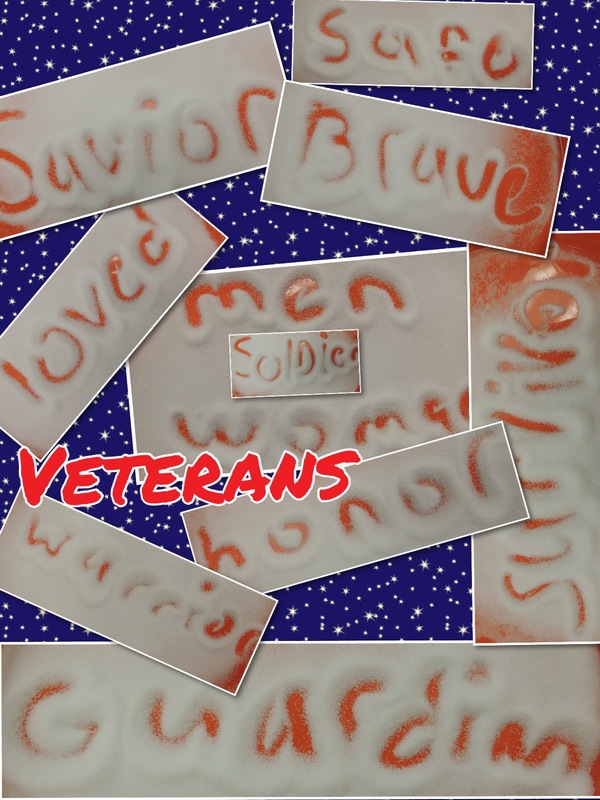 I typed the words in as we discussed them and through the finished image up on our class webpage for kids to share at home. Following that, students had to choose their favorite word and trace it in salt on our own plate. I did use a a colored plate, just to make the image clearer. 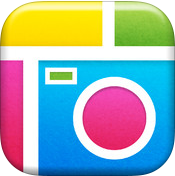 I photographed each image and loaded them to our Photo Stream. Students then pulled all of the salt words into a Pic Collage. Their finished projects are coming out great. Tomorrow’s extension is a brief writing activity. Students will choose one word from their Pic Collage and defend and support why it is the most important word in the image. I’m anxious to read the responses. The kids were so incredibly thoughtful in their word choices, I can’t wait to see them defend them. Students created a Tagxedo word cloud of dialogue tags. We’ve been studying dialogue the past couple of weeks as we worked on spooky narratives. Students studied the dialogue rules (chanting comma, capital, quotations ad nauseam), edited copious DOL style sentences, created a tombstone for Said (because Said is Dead) listing a ton of different dialogue tags, creating both a Wordle and Tagxedo word cloud with dialog tags, and included at least two examples of dialogue in their Halloween narratives. Noticing that we still didn’t quite get this whole separate the tag from the quote thing, I did a quick reteach and then what turned into a bulletin board worthy performance assessment. I read the famous Where the Wild Things Are aloud to my children, having them point out the few examples of dialogue found in the book. (I also planned an editing lesson using that book – it’s full of run on sentences!) I also pointed out that the Wild Rumpus has no words. I made it my students’ job to give words to the Wild Rumpus. Students each chose a page from the story and used sticky notes to add dialogue to the illustration. The requirements were that the dialogue had to be relevant to the story, include dialogue tags (keeping in mind that Said is Dead), and use appropriate conventions. Once the students had created their conversation, they uploaded a photo of their page from Dropbox to the app Comic Touch Lite. Here they added speech bubbles for each character to the image. Even though they were technically speech bubbles, the students had to include the dialogue tags as well because we’re working on the punctuation of these types of sentences. The results came out awesome and totally became my next bulletin board.